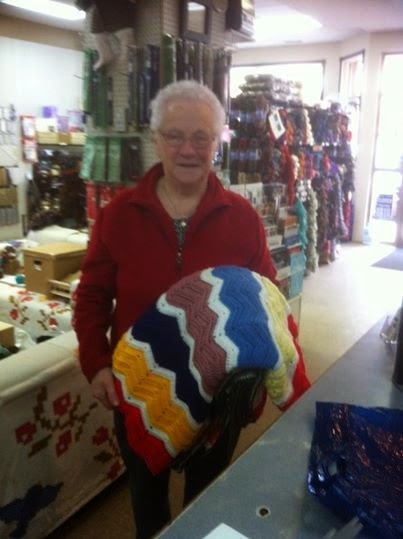 We love Blankets for Canada and here at Crafty Lady it's a charity we happily support. Blankets for Canada began in 1998. Blankets for Canada takes donation of handmade blankets and distributes them to the homeless and other people in need of warmth. Imagine being homeless in Alberta. A blanket can be make a huge difference in surviving the cold winters. Blankets also provide a sense of security and it is a message to those who are often alone, that someone cares. Homelessness can happen to almost anyone. Many Canadians live paycheck to paycheck. An illness that prevents someone from working, an abusive marriage that requires sudden flight - often with children in tow, mental illness, alcoholism, unemployment, or a series of bad breaks can cause someone to be homeless. Many of these homeless are women with children, or teenagers escaping abusive homes. It would be nice to be able to provide safe homes for everyone, but until that happens, every little bit we do can be helpful. We have ladies who volunteer their time making these blankets and we like to be able to provide them with the yarn to do so. We not only accept donations of the blankets, but we also accept donations of worsted weight acrylic yarn. Yes, wool is warmer, but it doesn't keep someone warm who is allergic to it, and wool requires more cleaning care. So check your stash. 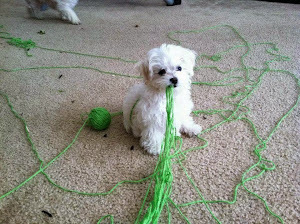 Is there some worsted weight yarn that you could give up? Those big box stores' large balls are perfect. We're also looking for volunteers to sew together knitted and crocheted squares. We have quite a few of them sitting in bags (squares not volunteers. Putting volunteers in bags would not be nice). For more information about Blankets for Canada you can visit this website. Canada. This picture was in April 2013. She's almost at 400 now! So right from this store there are several ways you can participate. 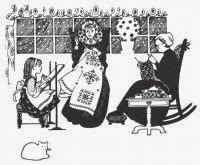 Volunteer to knit or crochet either full blankets or squares - it's a great way to still do your favorite hobby, especially if you've already knitted or crocheted everything you and your loved ones want. And as an incentive to giving up your yarn, we occasionally have a bag of yarn given to us that cannot be used for blankets. You are welcome to look through it and take skein for skein if you like what you see. Want to start right now? Find a afghan pattern you would love to do, grab some worsted weight acrylic and start knitting or crocheting! Here's some patterns if you want to do squares. New worsted weight yarn (machine washable) You can use leftovers from other projects. A great way to use up that stash! Any pattern can be used to make the square. This is a great way to practice a new pattern! But if you need more direction, here's a couple of patterns. Squares are 8"x 8". Row 1: Dc in 3rd chain across from hook, then in every ch across. Row 2: Dc across the row. C2 and turn. Repeat row 2 until piece measures 8"x 8"
Each blanket is made up of 48 squares to create a 48"x 64" blanket. If you choose you can make strips instead of squares which cuts down on the joining process. When your piece measures 8" tall cast off and weave in ends. Garter Stitch - Knit every row until piece measures 8"x 8". Stocking Stitch- Row 1: Knit all stitches. Row 2: Purl all stitches. Other variations can be found at Blankets for Canada. And remember, we don't make mistakes. We make ORIGINALS! Posted by Anna Maria Junus (happy employee who thinks Blankets for Canada is a great opportunity for anyone to volunteer their help). The All Grown Up and Now We're Legal Sale!